Dark Tattoo - When COVERING A DARK TATOO it is advisable to take a round barrel red sable brush (#14 to #20 size) and stipple the fleshtone color over the dark areas first until they disappear. Then airbrush over the tattoo to smooth out the stippled area and acquire a nice blend into the natural skin. This avoids build up. 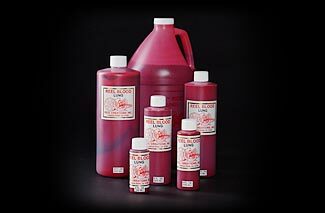 REEL BLOOD Lung Formula is especially formulated for dark skin, dark clothing or dark surfaces. It is the bright color of oxygenated blood from the lungs. Because REEL Lung blood uses a large amount of opacifiers DO NOT USE IN THE MOUTH. WARNING: Not to be ingested. Do not use in eyes or any other open orifices of the body. Not for body contact circulation systems (i.e. showers) bacteria contamination will occur. Once used, discard.